This product was added to our database on Tuesday 3 September 2013. 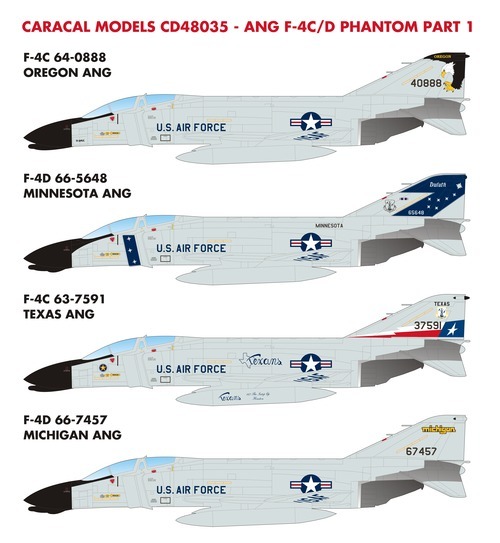 Caracal Models will release a new series of USAF/ANG Phantom decals during Summer 2013. The first sheet in this series, CD48035, covers four colorful Phantoms from the early 1980s when the Phantom was the primary fighter in ANG service. This sheet was designed to fit the upcoming Academy F-4C kit, but will work wit h the existing accurate Phantom kits from Hasegawa and Revell/Monogram as well. A separate, second sheet includes enough stencilling for one ANG Phantom in the overall ADC Grey scheme, including walkways. Both the main markings and stencill ing sheets are professionally screen printed by Cartograf in Italy.